In his exclusive interview with "Good Morning America," Charlie Sheen admitted to being completely out-of-his-mind high on Charlie Sheen. But the highly edited conversation cut right before Charlie went on to list a few other things he is currently high on (none of which show up in standard drug tests). 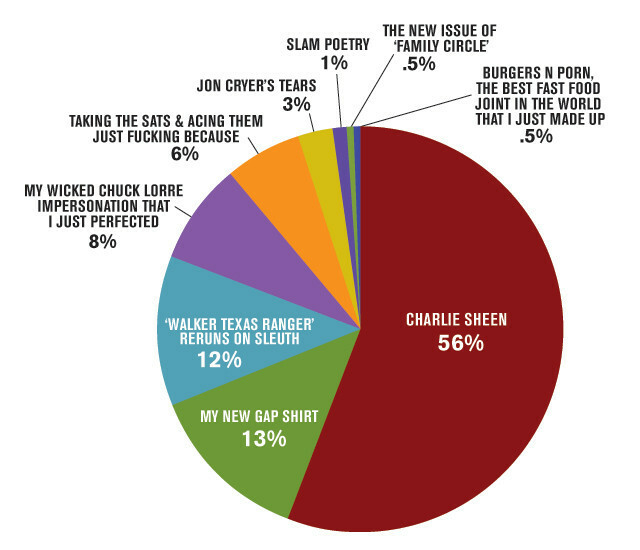 We illustrated them in the pie chart below, and as you can see, though he is mostly high on Charlie Sheen there are several other "substances" currently in the troubled actor's system.